Amazing Spider-Man Presents: Anti Venom -- New Days to Live #2 will arrive in stores on Oct. 28 from Marvel Comics. The issue is written by Zeb Wells, with art by Paulo Siqueira and a cover by Mirco Pierfederici. "Eddie Brock is waging a one-man war against the guilty as the sin-purifying symbiote, Anti-Venom. But someone forgot to tell him about another one-man war, Frank Castle -- the Punisher. As the streets erupt in violence, these two men can¹t help but be on a collision course with those who prey on the innocent ­ and each other! Will anyone be left standing for issue #3?" Amazing Spider-Man Presents: Anti Venom -- New Days to Live #2 will be 32 pages and will cost $3.99. Dark Avengers #11 will arrive in stores on Nov. 18 from Marvel Comics. 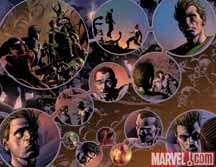 The issue is written by Brian Michael Bendis, with art by Mike Deodato and Greg Horn and a cover by Dedoato. "The Dark Avengers were never known for their mental stability, but Earth's Mightiest 'Heroes' may just go crazy in Dark Avengers #11 as they face their greatest threat! With Norman Osborn's mind deteriorating rapidly and The Sentry missing, how can the Dark Avengers fight an already unstoppable enemy? And even if they do win, will they ever be able to carry out another mission?" Dark Avengers #11 will be 32 pages and will cost $3.99.